A contemporary solid color heavy gauge indoor or outdoor flannel back vinyl tablecloth pattern that is suited to all your entertaining needs. 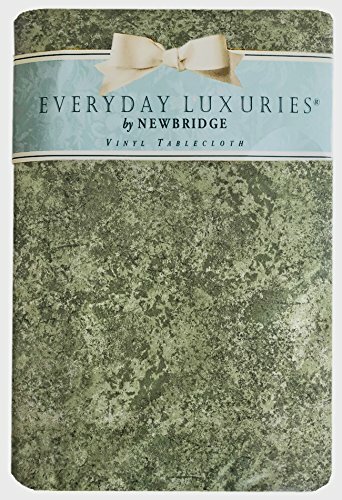 The Milano Marble Print Flannel Backed Vinyl Tablecloth by Newbridge is designed to be a favorite for your busy home or restaurant designed on heavy 4 gauge vinyl with a thick lofty polyester flannel backing. The Marble patterned tablecloth features a textile with a marbleizes appearance in beige, gold and sage green. Great vinyl flannel backed tablecloth for use with adults and children for at home or in commercial setting that are either indoor or outdoor. Perfect for decorating and keeping your table protected from everyday accidents. Like plastic, the easy-care vinyl surface can be wiped clean with a damp cloth or sponge. Vinyl top layer adds a protective waterproof layer. Flannel backed to reduce skidding and slipping on most surfaces. Finished with sewn edges. Easy to fold and store when not in use. Great for indoor and outdoor, home, and commercial use alike. Great for Indoor and Outdoor Entertaining, Barbeques, Dining, Parties, Picnics, Restaurants and Cafeterias - Easy Care - Wipe Clean - No Laundering. Milano Marble Print Flannel Backed Vinyl Tablecloths in Heavy 4 Gauge Vinyl is available in a large selection of sizes and shapes for all of your indoor or outdoor entertaining needs. Sizes available are: 52 x 52 Square, 52 x 70 Oblong, 60 x 84 Oblong, 60 x 84 Oval, 60 x 102 Oblong, 60 x 120 Oblong, 70 Round and 70 Inch Zippered Umbrella Round. Colors available: beige, gold and sage green. If you have any questions about this product by Newbridge, contact us by completing and submitting the form below. If you are looking for a specif part number, please include it with your message.